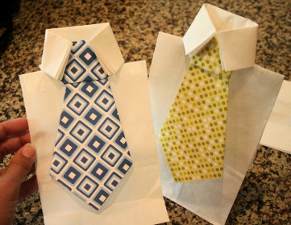 These Father's Day Tie Gift Bags are so easy to make,and you can create them with materials you already have! Place your present inside the bag before you get started. 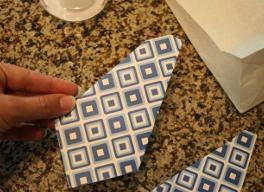 Fold the top of the bag down (maybe 1 ½ inches) and make a nice crease. 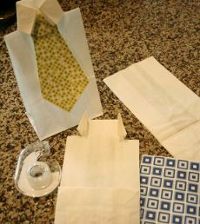 Then, cut the bag at the bottom of the fold on each side, leaving the strips of the bag that can be folded down to make a collar. I just used some clear tape to secure the “shoulders” so that the gift won’t come out. A 3D dot adhesive is nice for the collar wings, but they can be glued or taped as well. I used scrapbooking paper (4x6 matting size) to make the ties, always taking advantage of the nice corner of the paper, and then eyeballing the folds I’d make on either side. Folding the paper looks more like a real tie. I folded the edges of the leftover paper to make a strip to wrap around the base of the tie to look like the knot at the top. Can you please explain how you cut out/made and "eyeballed the folds" to create the Tie? or include another picture? I want my Tie to look like yours and not just cut out a Tie shape...Thanks! LOVE THIS! So cute, I love this, will make this today. fabulous!!! It is not very good, IT IS EXCELLENT! vERY CLEVER.